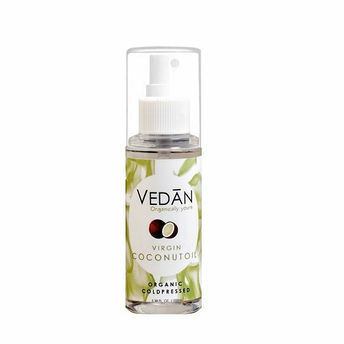 The Vedan Virgin Coconut Oil is an excellent lubricant that works amazingly well on all skin types. This oil reduces wrinkles and sagging skin. Coconut also works wonders in removing makeup as it is a 100% natural makeup remover. Furthermore, the Vedan Coconut oil improves the condition of hair by making it longer, stronger and shinier. Virgin Coconut Oil has zero cholesterol. Since it consists almost entirely of (good) saturated fat, its chemical properties are not damaged by heating. Even when used for frying, it keeps all its beneficial properties and does not "gain" any unwanted, unhealthy characteristics. Consuming VCO strengthens immune system, increases metabolism & improves digestion. About the Brand: Vedan takes pride in high-quality products namely, Virgin Coconut Oil, Baby Massage Oil, Desiccated Coconut Powder, Turmeric Powder, Kashmiri Chilli Powder & Daal Masala brought from the farmer to you via a natural processing unit in Mangalore. Alternatively, you can also find many more products from the Vedan Virgin Coconut Oil range.